Over the last month, I have had the opportunity to talk to a number of wellness, nutrition and fitness experts and get their insights and advice. Last night, after feeling sluggish all weekend, I decided to check out some supplements to help with my energy at my local heath food store. While I was there browsing, it hit me. One thing that many of the experts had recommended was detoxing the body of stored toxins. I knew it was time for me to give it a try and report back to the Fit Marriage community about my experiences. What is a Body Detox? For those of you who don’t know, detox is the process, real or perceived, of removing toxins from the body. This can be as simple as changing the food you eat to an internal cleansing program like I have chosen. Since my family has already made changes to our foods, eliminated caffeine and made positive changes in our overall wellness, it was time for a full body internal cleansing. FYI, this is my first ever detox of this kind. What this program is not. As I looked at the many choices for body detox programs on the shelf, I was perplexed on which one would be right for me. I quickly grabbed one of the knowledgable associates and started asking questions about the different types of detox programs they had. There were cheap ones to fairly expensive ones. Some used tablets (I don’t take tablets as our bodies are not able to break them down enough to feel the benefits), capsules (better and usually what I will use), and liquid (the best way for our bodies to assimilate a substance). 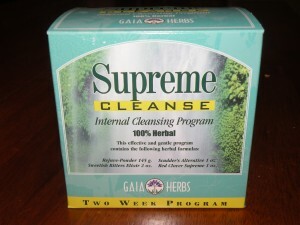 During my conversation with the sales associate, she shared the Supreme Cleanse Internal Cleansing Program that she had just completed that would take two weeks. The kit contained a Rejuve Powder (fiber), Sweetish Bitters Elixir (liquid), Scudder’s Alterative (liquid), and Red Clover Supreme (liquid). It is also 100% Herbal & Natural and made with only organic & ecologically harvested herbs. These were all a plus for me. The program requires that you take each of the 4 products throughout the day. Before breakfast I ingested 1 teaspoon of the Rejuve Powder in warm water, mid-morning and mid-afternoon I had 30 drops of Scudder’s Alterative and 30 drops of Red Clover Supreme in warm water, and before lunch and dinner I mixed 60 drops of Sweetish Bitters Elixir with warm water. The Rejuve Powder is a fiber and wasn’t any different from the fiber or greens products I have used in the past. It went down smooth with no issues. Scudder’s Alterative and Red Clover had a bit of a taste, but nothing that would stop me from moving forward. Now the Sweetish Bitters Elixir has a bitter taste and was the hardest to swallow. I had to chug this down both times and follow it up with a good drink of water. I also made it a point to drink about a gallon of water, which is not much more than I drink on a normal basis. At this point, I haven’t experienced much of a reaction. I felt some tingling sensations on my skin, and this was something that I had been told might occur when I purchased the Supreme Cleanse Internal Cleansing Program. I did feel like I had more energy while reading to my son this evening. Usually, I’m so tired that I can barely keep my eyes open while reading, but tonight I wasn’t tired at all. Drinking as much water as I have throughout the day causes me to have to visit the restroom every hour, if not more. This makes it a bit hard to get things done at times. Make sure if you do this that you have a restroom close by. As Day 1 comes to a close, I feel good and am looking forward to how I feel as the days progress. I’ll be reporting in here to share my experiences. Have you done a detox in the past? If so, what kind of detox did you do? Please share in the comments below!